Posted in Bright Ideas / Research on September 7, 2018. In the world of local SEO, citations have long been established as a necessity. But how much power do they hold in 2018. To find out, we asked a panel of 22 of the biggest local search experts to share their experience, knowledge, and insights into how citations affect local businesses today. This is the fourth time we’ve run the Expert Local Citation Survey, having previously published editions in 2016, 2015 ,and 2013. Where relevant, we’ve included comparisons to past editions of this survey. A huge thank you to everyone who shared their excellent insights with us. You can find the full list of participants in the Contributors panel, and read their thoughts and opinions throughout. If you have any comments on the findings of the report and the future of citations, please let us know in the comments below. Are citations more or less important now than they were 12 months ago? What is more important, quality or quantity of citations? 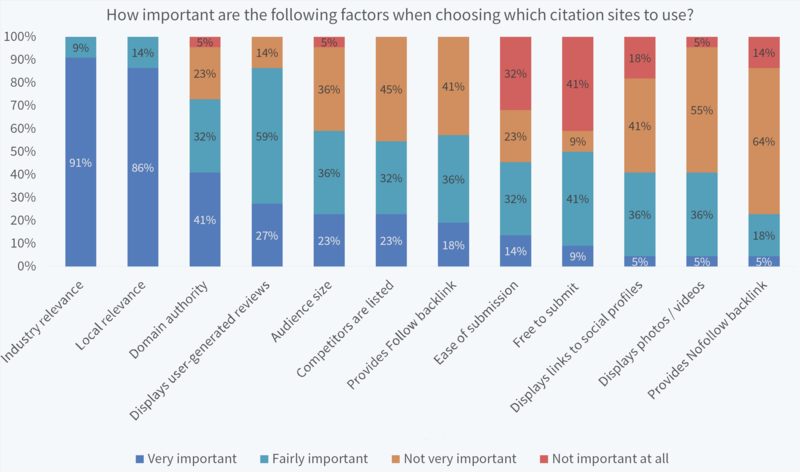 How important are the following factors when choosing which citation sites to use? Which type of structured citations provides the greatest authority? Which types of unstructured citations do you favor? What is your priority when building citations? How accurate does each NAP+W attribute need to be? For a typical new business, how many citations should you aim to build in the first 2 months? 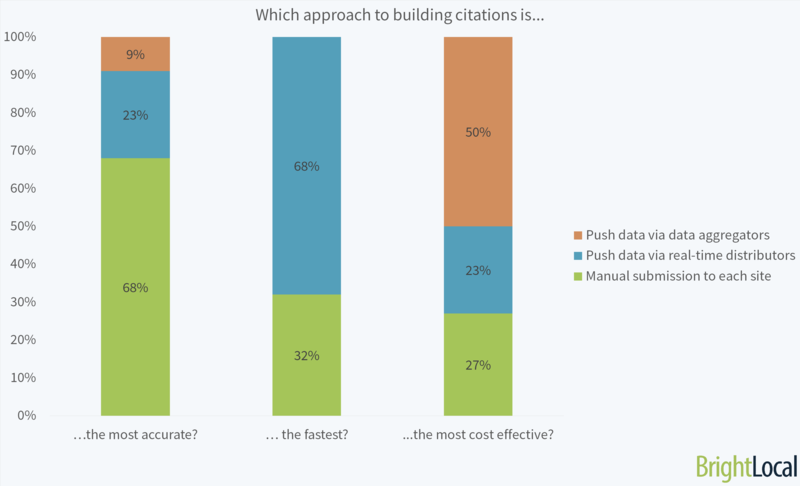 Which approach to building citations is the most accurate, fastest, and most cost-effective? How would you describe your approach to managing citations? As we found in our recent Local Citations Trust Report, incorrect or inconsistent online business information damages the trust of consumers. In this report, a huge 68% of consumers admitted they would stop using a local business if they found incorrect information on online directories. But it’s not just consumers that are affected by citations—it’s search rankings, too. 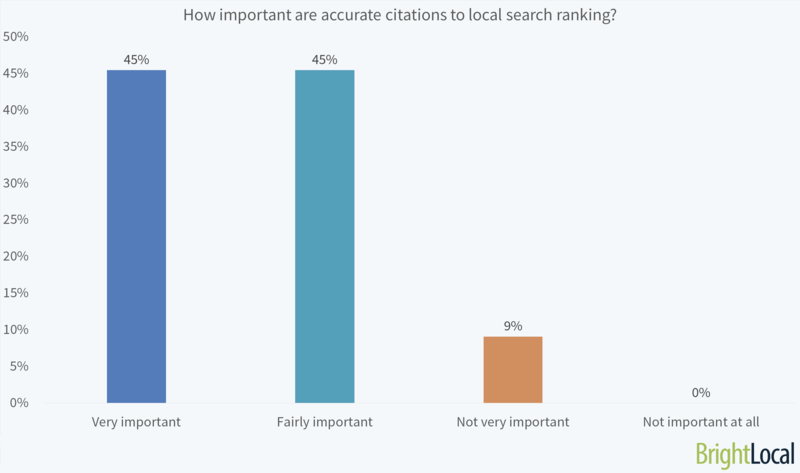 90% of the experts in our study report that accurate citations are important to local search ranking. While citations have become known as a foundational tactic in local SEO, there’s little to suggest they’ve become obsolete. In fact, none of the experts said that citations aren’t important in search rankings. 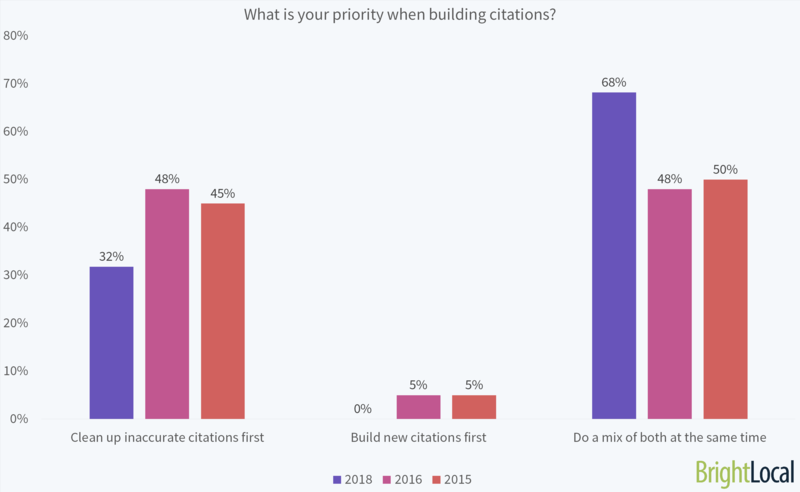 However, the below insights show how the use of citations is changing—exploring where the experts recommend having citations, how many a new business should aim for, and what’s changed over the last few years. The more prominent and consistent your business is online matters. When a search engine can see that you have more mentions than your competitors it only makes sense that this could affect the way the algorithm sees you as an entity. At the end of the day, getting citations done is a necessary evil. They are not as important as they were a few years ago, but the same thing holds true as it was back in the 90s. If you can get a link or a mention on a relevant website that your customers would care about, then go for it. The worst thing that can happen is you gain more traffic. Citations are an important piece in any foundational local SEO strategy – but in our experience, they're not often "the thing" that will give one business a competitive advantage over another in SERPs. Get them cleaned up and submitted right, and keep an eye on them to make sure nothing weird's going on, but don't invest a ton of time in obsessing over them. Google and Facebook continue to grow in importance while other sites are generating fewer phone calls, driving directions, website visits, and other local marketing KPIs. From a Google ranking perspective, citations are still worth spending time on, but continue to diminish in importance in what will improve your Google visibility when compared to other factors like Reviews and traditional SEO factors. Fixing and adding citations can be helpful if a business is not appearing in the Local Pack/Finder. It’s not as effective for businesses that already are in the Pack/Finder. While every expert believes citations remain important to rankings, most think they’ve become less important than in the past. When we’ve previously run this survey, a smaller number of experts said citations were becoming less important. Two years on from our last edition, 59% of the experts believe citations have become less important—significantly more than the 19% who thought this in 2016. However, this is by no means bad news for local SEO professionals providing citation services to their clients. Citations remain an important piece of the local SEO puzzle—but now this puzzle has grown to include other important ranking factors too. From where I sit, the impact of citations on local search rankings has changed significantly over the last 4-5 years in two major ways. Key citations have become table stakes in many industries (i.e., if you’re not there, you probably won’t rank) but rarely move the needle in competitive markets. Given the rising importance of reviews and Knowledge Panel engagement, the relative value of citations overall is definitely in decline. The accelerating growth in Voice Search, and to a lesser degree, Image Search, presents new challenges and opportunities for local optimisation. Over the course of the next year it will be worth evaluating changes in the influence of citations alongside other local SEO ranking factors. Citations are nowhere near as powerful or important as they used to be. Don't get caught up in old-school Local SEO tactics and try to blow out citations – knock out the important ones and move on! Same old. Nothing changed in the past year or since the time Google started giving less credit to data consistency from other sources. The local search ecosystem has become a lot less organic—the citations process is hindered (in our opinion) by the increase of pay-to-play sites, especially those taken over by Yext. Top quality sites are by far the favored route for citation building from our experts. But what constitutes a top quality site? One approach to consider is targeting the citation sites with the highest domain authorities. It’s also worth looking at others in your industry, and making sure you have a presence in the niche places your competitors are. We recently released our SEO Citations Study, which explores the citation profiles of 122,125 businesses across 26 different industries to find out which sites were most popular for each business type. Focus on these quality sources first, and look to your competitors to know what quantity works best for your locality. Remember, quality is always better than quantity. For businesses trying to cultivate a strong local presence online, building a collection of quality citations is crucial. Authoritative citations can improve a business’s visibility and help it rise above competitors in search results. We equate citations to the ante you have to pay to play in the Local SEO poker game. They're a foundational factor that needs to be right, but once you've got the foundation handled, they're not as important. It's definitely a quality over quantity thing, so we really only care about the "big" sites and then any local or business related sources that would matter for that particular business. Typically more work in the first few months, and then just monitoring after that (with the occasional unstructured citation grabbed here and there). Focus as many resources as possible on completely optimizing your business profiles on Google and Facebook before shifting attention to other citation sources. Maximizing your CRO on Facebook and Google and other revenue-centric metrics, then improving accuracy on 2nd and 3rd tier sites. When identifying which citation sites a local business should be on, there are a number of factors the expert panel value. The least important factors to the experts were NoFollow backlinks, the ability to use photos and videos, and the inclusion of links through to social profiles. However, these were still valued to a lesser degree. We prioritize citation websites differently depending on the client's needs. If we have a client who's just moved into a new market, we'll focus more on getting them coverage on local news sites and make sure they're listed alongside well-established local competitors in local directories. If we have a client who needs to get more qualified leads, we'll identify sites where they have a greater opportunity to connect more directly with their target audience. The best citations are those that are most likely to be seen by people who have the potential to become your customers. In my view, if anything has changed, it's that local quality links matter even more. By quality, I'm talking relevance, as in topical and location, as opposed to DA or something like it. Think about what you'd use to distinguish businesses in real life. Now think about how Google might try to "proxy that" with the data they have available. Do more of that. I still see value in using data aggregators and generally creating a broad profile of citations, but in our listing management activities we've shifted focus increasingly to what we call the Top 6: Google, Yelp, Facebook, Foursquare, Bing, and Apple. For hotels and restaurants I'd add TripAdvisor. Businesses stand to gain the most by focusing not just on basic NAPW on these top sites, but also on the truly differentiating factors like photo content and review response. Citations don't play as big of a role as they once did. Once you have the foundational citations in place you can focus on getting more niche and localized citations, but you're also making the effort for the link. Pay attention to the link metrics where you can get followed links. Which type of structured citations provide the greatest authority? Structured citations are business listings that have a clearly defined presentation of a business’s name, address and contact details. On many sites, these listings use structured markup so that search engines can easily discover and interpret the data. 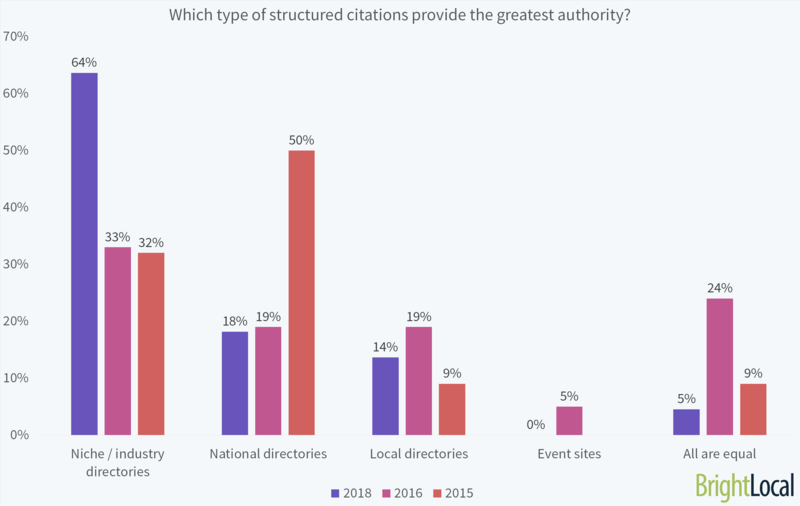 Since 2016, the importance of niche and industry directories have hugely grown – with 64% of the experts choosing this as their most valued source of structured citations. This is nearly double the number of experts who chose this in the last survey. National directories were favored by 18% of experts, remaining fairly static from 2016. However, when you compare this to 2015, there has been a significant drop in popularity. We look at each citation site as an opportunity with goals far beyond just helping businesses rank for Google's local results. In most cases, we choose directories that were created to provide a good customer experience, that can also send potential shoppers to worthy vendors. We work with enterprises that have hundreds or thousands of listings and have seen some interesting trends. In all cases, any time we built relationships that yielded high authority and locally relevant links to the locations nationwide, we saw a large spike in rankings within a 90-day period. Citations are mostly commoditized at this point, so having NAP consistency and coverage on its own doesn’t offer competitive advantages. We’ve also seen that anything we can do to increase the volume of business name searches for the business has yielded great results. This includes tests such as offline advertising asking the user to Google the business name (via radio or print), which engineered CTR increases. Google comes first—adding old, additional phone numbers and updating addresses can go a long way. Then sites that are ranking well for that industry, which almost always include Facebook and Yelp. Fix the major, industry-specific publishers, like Vitals in Healthcare. The experts were able to choose up to three choices. Social media company pages was a new addition to this year’s survey. Interestingly, local government sites have grown in importance since the last survey. Local blog sites, on the other hand, have fallen out of style. Unstructured citations are gaining influence in the local citations space, as they are a powerful indicator of brand influence. Many years ago Eric Schmidt of Google was referring to inaccurate information, and said, "Brands are how you sort out the cesspool." Whilst we need to focus on accurate NAP data, we also can't ignore the growing influence of unstructured branded signals. While local news, government, and industry specific sites can improve prominence, the real money maker is still Wikipedia. Does the business have a reason to have a Wikipedia page? If so, prominence signals from there seem to outweigh everything else. We like citations that are with known entities such as local news stations, educational institutions or industry related groups. I think citations that are relevant to what you do and where you are higher quality. That being said, you'll still want to be in the main national directories as a foundational piece to your local citation profile. An unstructured citation from a local source such as blogs, magazines, newspaper sites can be seen as valuable since they reinforce the brand's reputation in the user's eyes. If they include a link, even better as this may lead to business and of course you are getting a backlink. The more relevant to the business, the better. For example, it's nice for a physician to have a link in Tupalo, but a link from more relevant sites like Vitals or Rate my Doctor is extremely valuable. When setting your citations strategy, the experts recommend cleaning up inaccurate citations before beginning to build new ones. The majority recommend doing both together. If you’re not sure which are the primary and secondary data providers discussed below, you can find the top 50 citation sites by domain authority here. Our tools offer a quick and easy way to identify duplicate and inconsistent citations, as well as to build the new citations that matter to your business from our network of over 1,400 national, niche and local citation sites. Find out which citation sites you should be targeting with a 14-day free trial. Get the major and secondary data providers correct ASAP. Then make sure the top industry and local sites are accurate for the business. Then, I'll probably just update incorrect data as I come across it. Our approach to managing citations is to make sure that there are no glaring NAP consistency issues. Then we make sure that most of the top 30 to 50 local citations are covered and after that we might look at some niche citations. After that we don't spend too much time thinking about them other than making sure the directories that show up for a branded search are accurate and optimized. Particularly for enterprises, duplicate citation cleanup—not just “suppression”—is probably the main citation-related tactic that I’d continue to pay a substantial sum for. Otherwise, just manage your listings directly in Google My Business and Facebook, and if you can afford the cost and the sales headache, Yelp. Then call it a day and spend your SEO budget on more productive tactics (like review solicitation, Q&A monitoring, and the like). Beyond Yelp and Facebook, Google seems to be moving more and more towards valuing vertical and local sources, most of which aren’t part of standard listing networks. In local SEO, NAP+W stands for name, address, phone number, and website URL. We often receive questions from local businesses about how correct and consistent their NAP+W data really needs to be to keep Google happy. Nearly every expert told us phone numbers need to be an exact match. The majority of the panel also said the city, ZIP code, and URL needs to be completely accurate. Suite number is the least important part of NAP+W, so if yours isn’t completely consistent, don’t stress! With the emphasis of NAP+W consistency, some will go overboard to ensure exact match across those values. Phone number and geocode (position on a map) are primary keys to match citations to Google's listing. Business name is important, but fuzzy matches work okay. If suite numbers or addresses drastically change the geocode, there's a problem; otherwise, don't sweat the small details. It's no longer necessary to get every single citation 100% correct. Devote your time to updating and building out the citations that matter the most. This is going to take research and knowledge of the local ecosystems for the industries you market. After you have the 20-30 main listings right for a business, continuing to build more citations is an exercise in diminishing returns. I think some people still get stressed out over small inconsistencies in citations that are not likely causing issues. If there are business name variations or other discrepancies on a couple important directory websites that you can’t get corrected, implementing Schema Markup on your website with “alternateName” and/or “sameAs” may help you sleep better at night. For new businesses just starting out, it’s evident that they should begin building citations. Citations are a foundational factor in local search ranking. The initial flush of high quality, consistent citations can have a valuable influence on a new business, but continuing to build these at a steady rate doesn’t have the same level of impact. Of course, it doesn’t hurt to have more, but the best benchmark is to compare your business to established competitors near you. To find out what’s the norm in your industry, explore our interactive industry SEO Citations Study. While there was no real agreement on the number of citations a new business needs, the average number of citations to build in the first couple of months is 35, with a median range of 21-30. I think citations are valuable for new businesses, but for businesses that have been around for a long time, the impact from spending effort on them is not great. We don't necessarily have a target number of citations to build per new business, but we'll identify target citations based on competitors / what we see in the market. We recommend a combination of manual listings management and managing at the aggregator level to improve organic Maps rankings (often using Moz Local for the latter). There are few general local-business directories (IYPs) worth bothering with these days. Maybe 20-25. To the extent you go beyond those, focus your energy on industry-specific and regional sites. It's less important these days to list your business on hundreds of sites that get no consumer traffic. We advocate spending more energy on building strong, competitive citations on top sites, with differentiating content like photos that will help you stand out. There are a number of factors to consider when deciding how to build and clean up your citations. We asked the experts to answer which type of citation service they would use based on the three needs outlined in the project management triangle: quality, speed, and price. Based on these different needs, the experts recommended a range of solutions. When developing your citations strategy, it’s important to identify what is most important to the local business. To me, distributors and aggregators are table stakes. The real difference makers are manual, industry, and location-specific citations and links. In fact, I think the table stakes are carrying less and less weight. Even if you use a real-time distribution platform (e.g. Yext) there is no guarantee Google will see the changes. If you're not making sure your citations are indexed it's going to be a while until Google sees those changes (if they ever do). We manage citations in 2018 as a necessity. It's something that's still very foundational and something we spend time on but we are going back to more manual submissions. We have not seen the cost benefit of using services like Yext for our citation management. A problem with broad networks of citations from some of the big real time distributors is that when companies update NAP information for a location, that data is pushed around the network but not all changes happen at once, some can take months before the partner makes an update. That leaves a local business's citations with conflicting old and updated information across different sites which may create some doubt with Google to the validity of that NAP information. Our approach to managing citations is to first evaluate the specific situation, including the accuracy of our client and other businesses present at that address, as well as industry opportunities. We then do a mixture of manual new citations, manual cleanup, and data aggregator pushes. Companies are making greater financial investment in their local visibility, and the levels of competition for specific areas is reaching fever pitch. There is no one-size-fits-all answer when it comes to managing citations; it depends on levels of competition, and more importantly on variables outside of our direct control—specifically user generated content and reviews. We manage citations via partnerships that tap into one major aggregator and are highly focused on maps based systems like Apple Maps, Bing, TomTom, Waze, Here, and Uber. Manual and detailed work with important business listings. I can't leave even small details unattended. Hence, I'm probably a perfectionist when it comes to citation work. Don't obsess. Your client's (or your) rankings don't come down to citations. Put some time into them, in a few sittings, spread out over a few months, and move on. Citation building remains an important piece of the local SEO puzzle. If you’d like to find out how our team of professional citation builders can help you identify the best citation sites for your local business, visit our Citation Building hub. Another huge thank you to all the experts who shared their insights for this report. We’ll be continuing to track the importance and usage of citations over the coming years, so let us know in the comments below any questions or thoughts you have on the impact of local citations.